usability engineering, user interface design as well as user interface development. Look and Feel Design, Look & Feel Design, Icon Design, Java Swing Development, Usability Engineering, GUI Design. 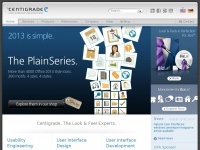 Centigrade GmbH is specified as the websites creator. six profiles were found for Centigrade.de in social networks. Among other social networks the website is represented in Facebook, Twitter, GooglePlus and Xing. The web server with the IP-address 89.107.186.78 used by Centigrade.de is run by WebhostOne GmbH and is located in Germany. The website Centigrade.de has a own web server. The web server only runs this website. The websites of Centigrade.de are hosted by a Nginx server and were developed in the programming language PHP. The content management system WordPress is used. The HTML pages were created with the latest standard HTML 5. The website does not specify details about the inclusion of its content in search engines. For this reason the content will be included by search engines. The homepage of the website is "/en".